Serve immediately with thin slices of toasted French bread, crackers, or apple and pear wedges. Place butter in a 9-inch pie plate. Microwave on high for 30 seconds until melted. Stir in almonds and microwave on high for 3 to 4 minutes or until golden brown. Stir every two minutes. 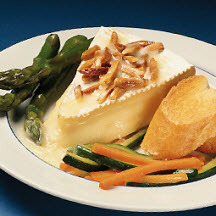 Place cheese on a decorative microwave-safe glass dish and top with the almonds. Microwave on medium an additional 30 to 40 seconds.